Armed with an umbrella, sweater and raincoat, I toured Edinburgh's Royal Botanic Garden on Sunday. While July temperatures in the mid-50s and scattered downpours do not deter traveling gardeners from visiting botanic gardens, I was amazed to find the garden packed with city residents and tourists enjoying their Sunday outdoors. Mothers pushed babies in prams, dads chased after runaway toddlers, elderly couples strolled arm in arm admiring the delicate alpines, Spanish tourists snacked on sandwiches in the Chinese pavilion, a group of American teenagers chatted about their European adventures, and a Japanese bride and groom kissed for the photographer while the caterer distributed flutes of champagne to their guests. 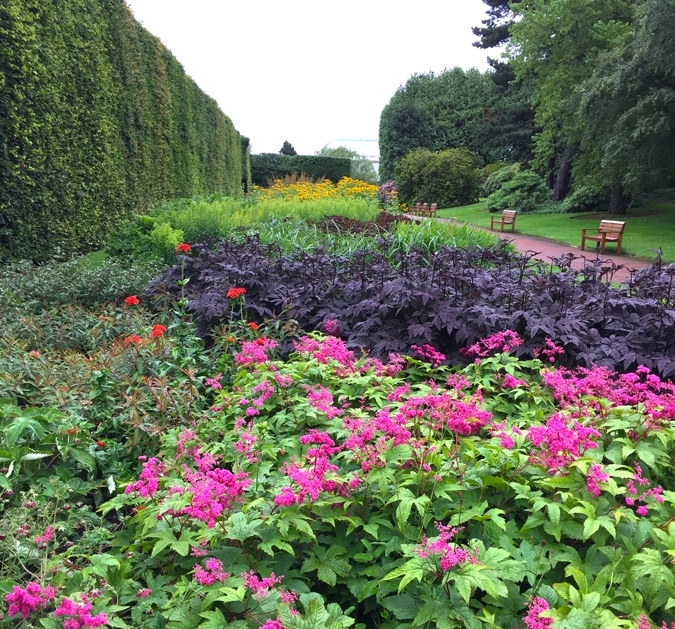 I walked around marveling at the 4' tall hardy geraniums, the swaths of Japanese primroses, the towering monkey puzzle trees, and the many plants from all corners of the world that I had never seen before. The 500-foot long Herbaceous Border, created in 1902, is backed by a commanding hedge of 158 beech trees. The hedge is pruned annually to retain its 24' height. Himalayan poppy (Meconopsis grandis) is popular in Scotland and grows to 4' with beautiful sky-blue flowers in June. Showcasing 128,000 plants from 156 countries, the Royal Botanic Garden Edinburgh (RBGE) is a living encyclopedia of horticulture that brings out the "plant geek" in all of us. The garden was founded in 1670 as a "physic garden" by two adventurous Scottish doctors who returned from a 'grand tour' of Europe determined to grow, study and identify plants for treatment of disease. Medical students were schooled in botany by the Head Gardener until the mid 1800s. With the expansion of the British Empire, the plant collections grew rapidly, and the garden was relocated several times to accommodate new acquisitions. It has been at its current site on the outskirts of the city center since 1821. The Chinese Hillside is the result of plant hunter George Forrest's seven trips to Yunnan between 1904 and 1932. Winding paths, a waterfall, bridge and pavilion are placed among 16,000 plants collected from Yunnan, many rare and endangered. Young monkey puzzle trees in the Biodiversity Garden which illustrates the evolution of plants. One of the first things that you notice when visiting the garden are the magnificent and unusual trees set in a stately, park-like setting of 70acres. Some of these trees were moved from the garden's previous location and are more than 200 years old. Others were acquired as seeds from habitats that no longer exist, such as the extremely rare Catacol whitebean. Only one other specimen of this tree exists in the wild - in a ravine on the isle of Aran. A stand of coastal redwoods planted in the 1920s creates a cathedral-like atmosphere and is a popular site for weddings. RBGE's glasshouses offer ten distinct climatic zones with thousands of flowering plants, cycads and ferns. The Temperate Palm House, currently under renovation, was built in 1858 and is one of the tallest in the world. The Plants and People House showcases plants that are integral to our daily lives - sugar, cocoa, rice and coffee, as well as giant water platters. Other glasshouses feature plants of the desert, the rainforest and mountain regions. 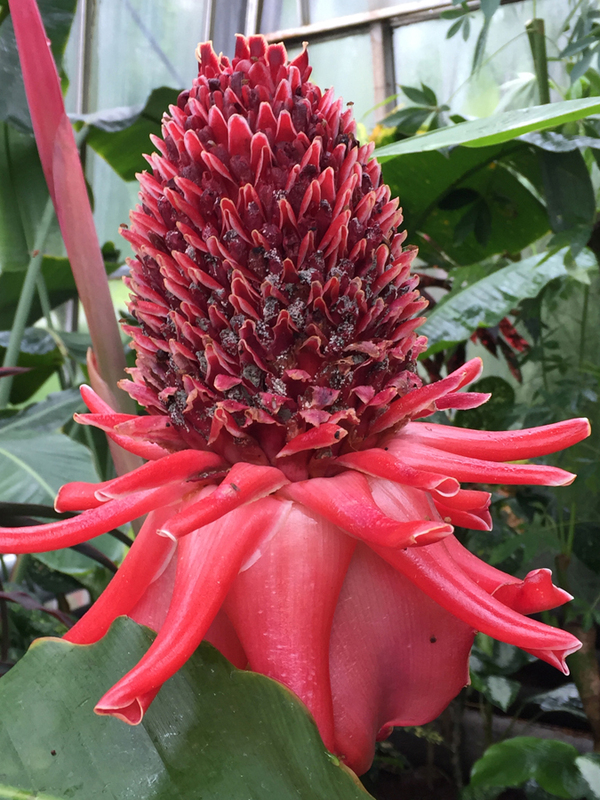 My favorite was the Lowland Tropics House and its collection of gingers that sported the most unusual flowers (see red pinecone below). Themed gardens illustrate various habitats from around the world. The Alpine Garden exhibits plants from high mountain tops which are a real challenge to grow in Edinburgh's maritime lowlands climate. Alpines are important to RGBE's conservation work, as they can be indicators of global warming. The Alpine House and Tufa House protect these tender plants from the wet Scottish climate. Troughs are used to create individual landscapes representing miniature mountain tops. The Rock Garden features 5,000 plants from the great mountain ranges of Chile, China, Europe, Japan, South Africa and North America. Dwarf conifers, bulbs and rhododendrons complement true alpines. The neighboring Scottish Heath Garden shows off Scotland's iconic shrub. The Queen Mother's Memorial Garden was formally opened in 2006, and reflects the Queen Mother's love of gardening. A Celtic-style labyrinth planted with bog myrtle is surrounded by perennial beds and a charming pavilion. The Memorial Pavilion within the Queen Mother's Garden is decorated with shells collected by schoolchildren from around Scotland. The ceiling is lined with pine cones from RBGE's gardens. The Demonstration Garden is used by local schools and students in RGBE's Horticulture and Herbology courses to experiment with growing crops and medicinal plants. Swaths of primroses, trilliums and other shade lovers thrive in the woodland garden, along with rhododendrons and magnolias. Many of these plants look like they are on steroids: Edinburgh's mild, wet climate provides ideal growing conditions. The Royal Botanic Garden Edinburgh is open daily except Christmas and New Year's Day, and features a restaurant, cafe, shop stocked with gifts and plants, and seasonal exhibitions and events. Admission is free, with a small fee for the glasshouses. See rgbe.org.uk/edinburgh for more info.